"It's President Trump who should receive the Nobel Prize," South Korean President Moon Jae-in said, following Friday's summit with North Korea. Moon is seen here hosting Trump at the Blue House in Seoul in November. The remark follows Friday's historic summit between Moon and North Korea's Kim Jong Un, in which the two leaders agreed to work toward eliminating nuclear weapons and reaching a permanent peace deal on the Korean Peninsula — aspirations that the pair embraced without going into detail about how to achieve them. Moon was responding to a letter from the wife of former South Korean President Kim Dae-jung — a leader who won a Nobel Peace Prize for his efforts at making peace with North Korea. The letter said Moon deserves a Nobel for his progress this time around with the North, triggering Moon's mention of Trump. "It's President Trump who should receive the Nobel Prize. We only need to take peace," Moon said, as translated by NPR's Korean interpreter Se Eun Gong. The comment about Trump came during a Cabinet meeting on Monday. The Blue House has confirmed the accuracy of the quote. Moon has the political capital to make these kinds of statements about Trump, however eyebrow-raising they may be to his domestic constituents. That's because he's riding a popularity wave coming out of Friday's summit in the border village of Panmunjom. His approval rating soared to 86 percent following the meeting, up 12 percentage points since mid-April. Some 88 percent of South Korean respondents in a Hangil Research poll said they support the Panmunjom agreement that was struck with Kim. 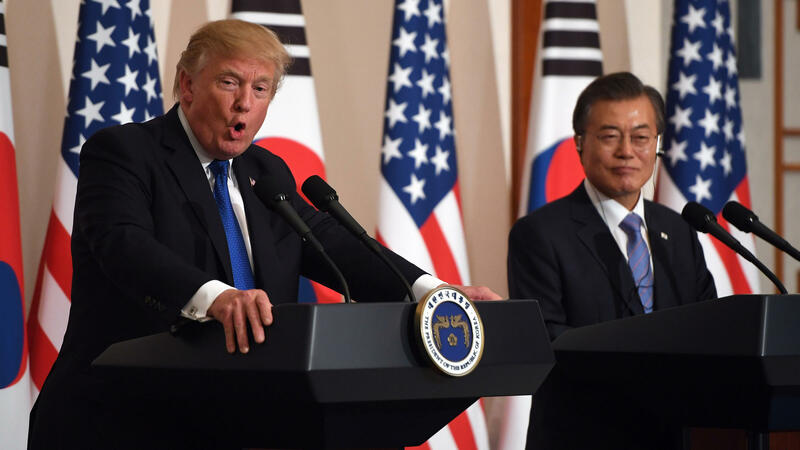 The South Korean leader also has diplomatic reasons to keep Trump aligned with his goals for peace on the peninsula: Moon told his Cabinet he'd like to see South Korea "actively operate the trilateral channel for dialogue between the North and the U.S.," signaling Seoul will continue to play a mediating role as Pyongyang and Washington make their way toward their bilateral summit. Moon and Trump spoke by phone Saturday to discuss the recent summit and Kim's pledge of unity and peace. The White House said they "agreed that the unprecedented pressure" put on North Korea by international sanctions "led to this significant moment." In recent months, Trump has gone from engaging in a war of words with Kim to planning to hold a summit with the dictator — a meeting that is expected to take place within weeks. Before that encounter takes place, Trump also plans to meet with Moon. If indeed the two Koreas — technically in a state of war for more than six decades — are indeed able to reach a lasting peace and bring about the "complete denuclearization" of the peninsula, it would seem certain that a Nobel Peace Prize would be in the offing. The big question would become: Who gets the prize? The leaders of North and South Korea would be the most obvious choices — but Moon's idea about including Trump also echoes the sentiment of a crowd in Washington, Mich., where the U.S. president spoke on Saturday. "Nobel! Nobel! Nobel!" the crowd chanted, interrupting Trump as he spoke about the signs of progress he's seeing on the Korean Peninsula. "That's very nice, thank you," Trump replied. "That's very nice."